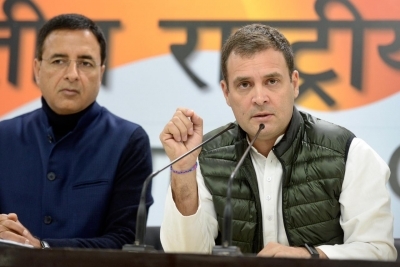 New Delhi, Feb 12 (IANS) Congress President Rahul Gandhi on Tuesday accused Prime Minister Narendra Modi of treason, alleging he violated the Official Secrets Act and divulged information about the Rafale deal to a private business entity. Citing an email by an Airbus executive, he questioned how the private entity met French Defence Minister prior to Modi's 2015 visit to the country during which he announced the deal to buy 36 Rafale fighters instead of the 126 that was under negotiation during the erstwhile Congress-led UPA government. Gandhi said Modi, who is only other person to know about the deal, had informed the private entity about the deal. The then Defence Minister (Manohar Parrikar) said he did not know about the new deal whereas the private entity was sitting in the French Defence Minister's office saying the Prime Minister will sign a Memorandum of Understanding. The entity told the French side that he was going to get the deal and he got it. This was a breach of the Official Secrets Act, Gandhi alleged. This was treason, nothing less, the Congress leader said. "Modi was under oath to protect these secrets but he has now given this secret (to a business entity) who knew 10 days ahead of time that the biggest defence deal in the world was coming to him. "This itself is criminal. This itself will put the Prime Minister in jail," he claimed. He said the fresh revelations have added a new and more serious dimension to the deal along with the corruption and procedural irregularities and charged Modi with compromising national security. "Earlier there was the first axis of corruption, the second axis was procedural violations and now the third which is far more serious is handing over a defence secret. "The PM has compromised national security. He has given defence information to a person who is not supposed to have it. All these three are going to be investigated," he said. Talking about the CAG report on defence deals including on Rafale that is to be tabled in Parliament, Gandhi dubbed it "worthlessa" and "an attempt to cover up". "The CAG report is not Comptroller and Auditor General Report but Chowkidar' Auditor General Report. It is Narendra Modi's report written for the chowkidar, on behalf of the chowkidar, for the chowkidar and by the chowkidar," he added.